Jimi Hendrix’ simply doesn’t seem to wane, even though the genial guitar hero himself died in London in 1970 at 27 years of age. There’s still so much interest in Hendrix’ music that he continues to rank among the top ten of best-earning dead celebrities in Forbes magazine. 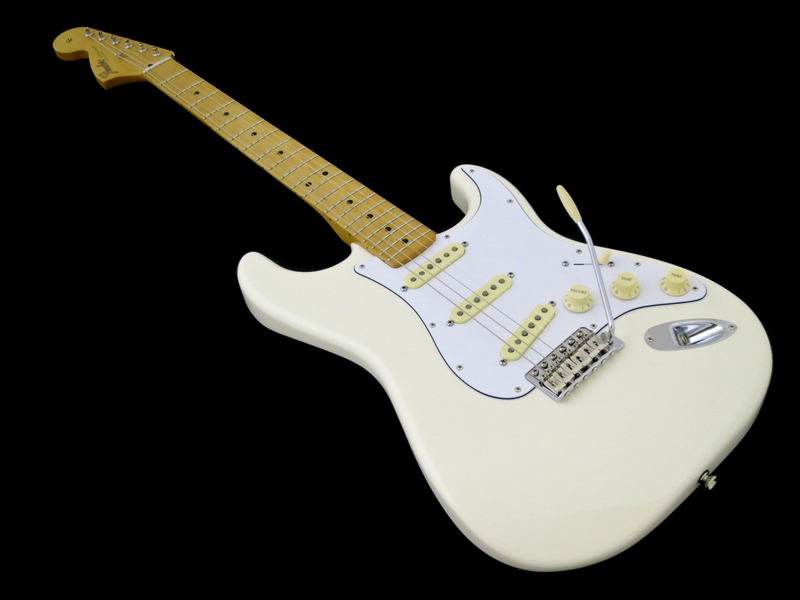 The Fender Stratocaster was the master’s favourite instrument, so it’s not really surprising that the man has been honoured with a signature model by Fender last year. This guitar is now also available in Finland. 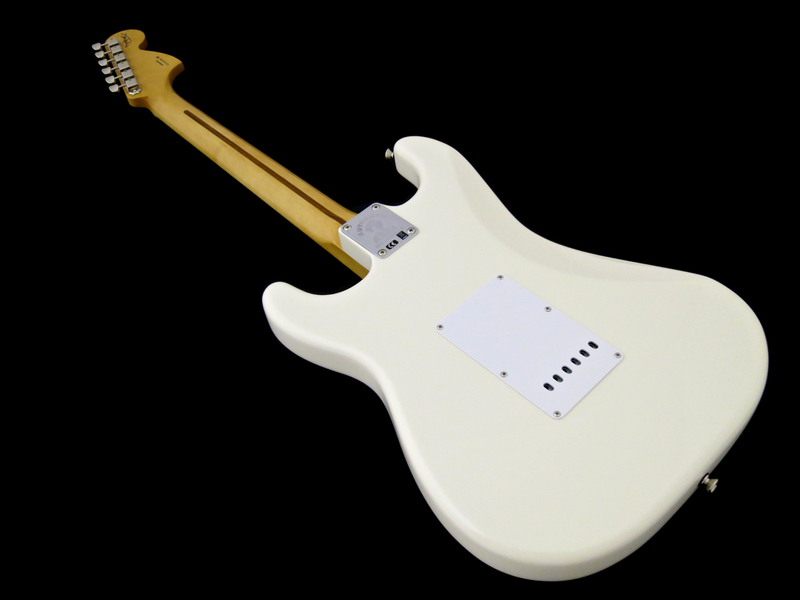 The right-handed alder body is finished either in black or in white, while the neck is a large headstock-carrying, left-handed, all-maple affair. 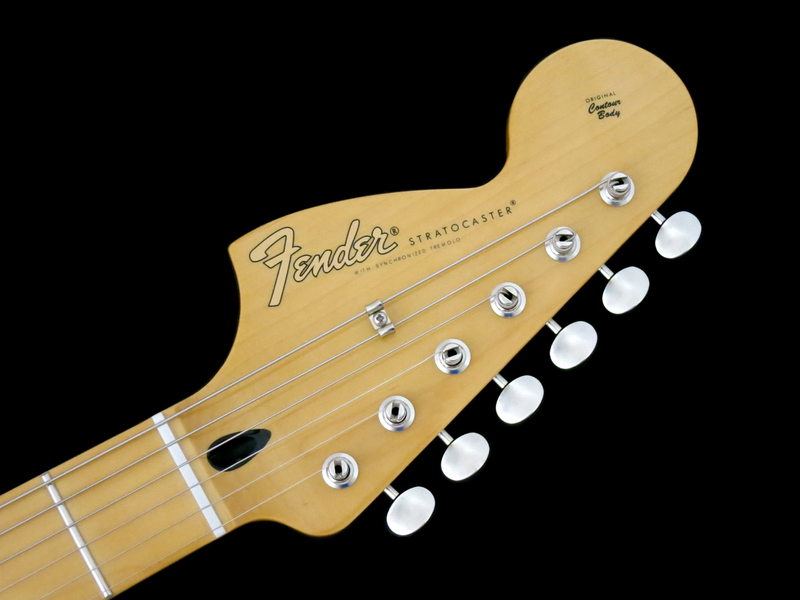 The headstock carries the so-called transition logo from the mid-Sixties, which was much larger than the Fifties’ spaghetti logo, but still gold coloured. By the end of the Sixties the logo was changed to black and the model name was written in large, bold lettering – that would be called the the CBS logo. 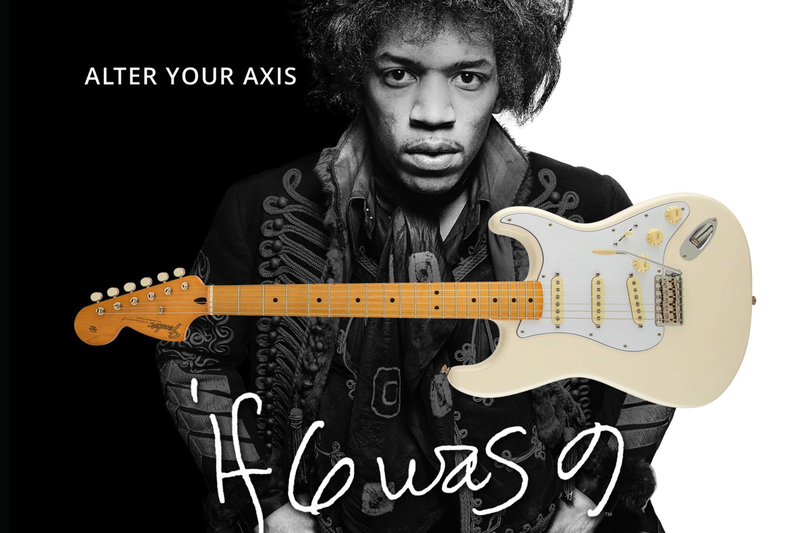 Modern improvements on the Hendrix Strat include truss rod access from the headstock side, as well as a flatter, more bend-friendly fretboard radius of 9.5 inches. 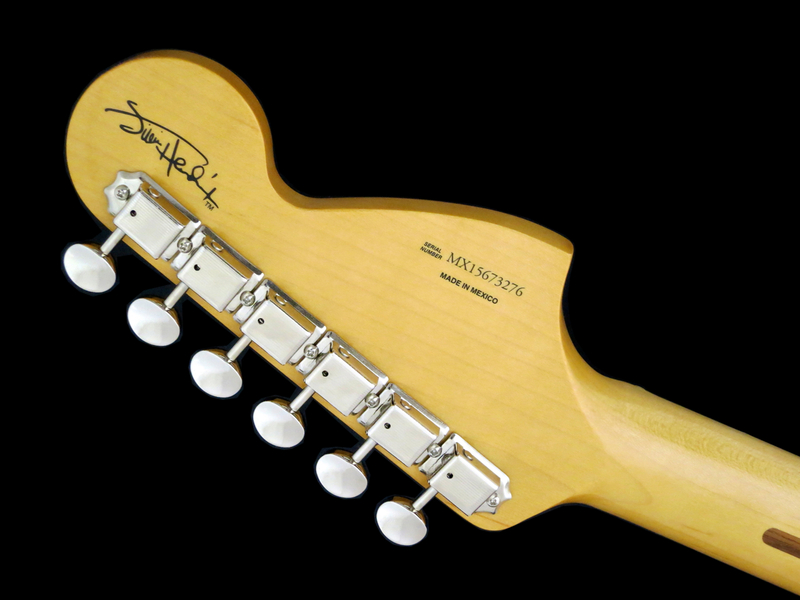 The headstock’s flip side displays Hendrix’ signature, and a very decent set of Kluson copies. 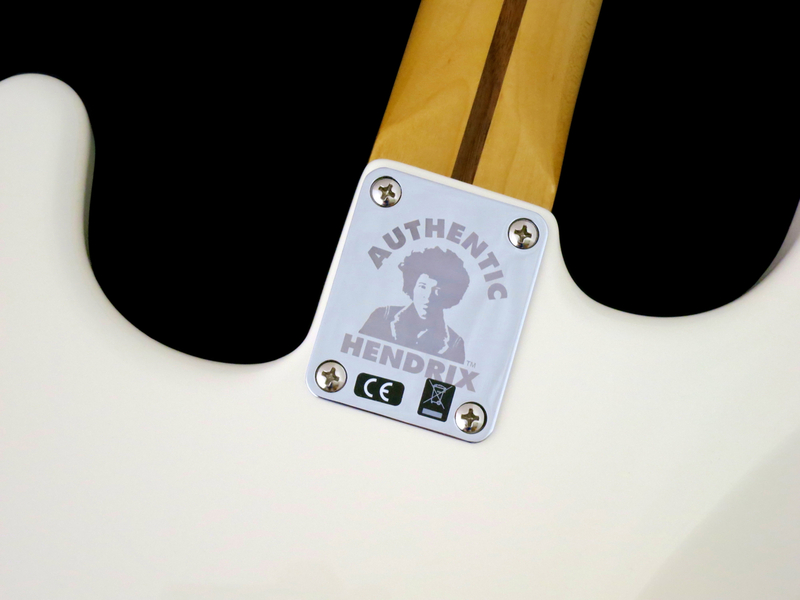 The neck joint has been kept very traditional, but for the Authentic Hendrix-logo on the neck plate. The Mexican signature guitar comes equipped with a pukka set of American Vintage ’65 Gray-Bottom Fender-pickups, which have been installed into this guitar, as if this were a left-handed model turned over. Both the neck and middle pickup have been flipped over by 180 degrees, while the bridge pickup has been flipped over first, before being installed at a reverse angle. Usually the bridge pickup is placed so that its bass side is closer to the neck with the treble side being closer to the bridge. On the Hendrix Strat the bridge pickup’s bass side is closer to the bridge and the treble side closer to the neck. This reverse installation means that the magnet stagger is “wrong”, changing slightly the balance between the strings in terms of output. 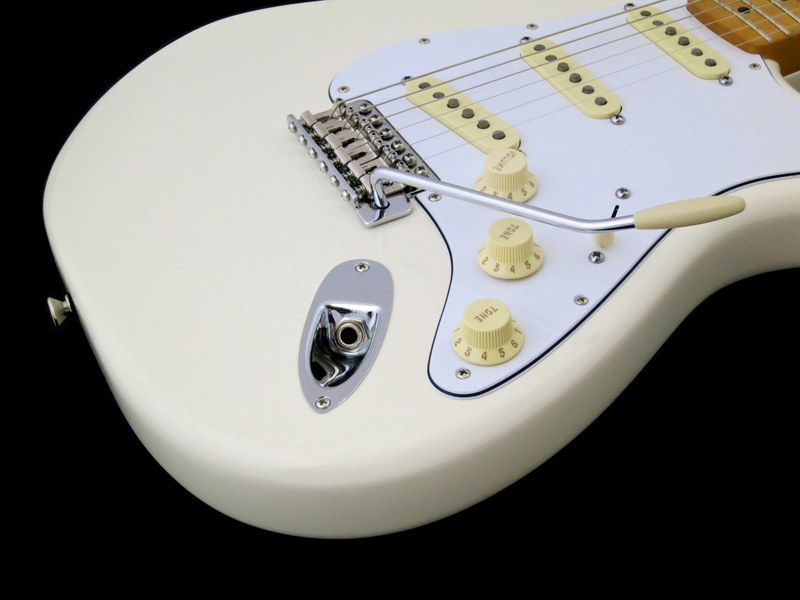 Furthermore, the bridge pickup will give you a slightly changed range of overtones, due to its reverse angle. We’ll find out in the listening test, whether these changes really make any discernible difference. The controls follow the vintage recipe – master volume, neck tone, middle tone – while the pickup selector on the Hendrix model is a modern five-way unit. 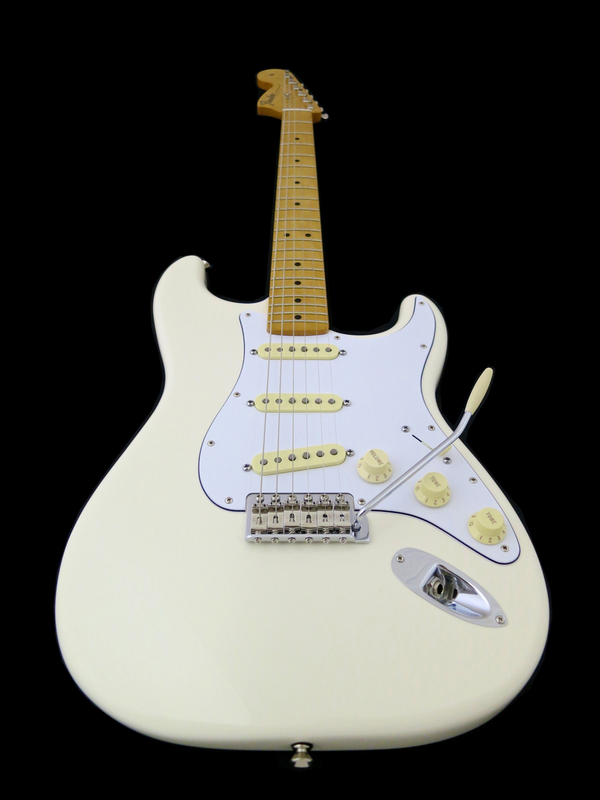 The American Vintage ’65 pickup set is true to the original specs and does not feature a reverse-wound/reverse-polarity middle pickup for hum-cancelling in positions two and four, like many updated Strats! 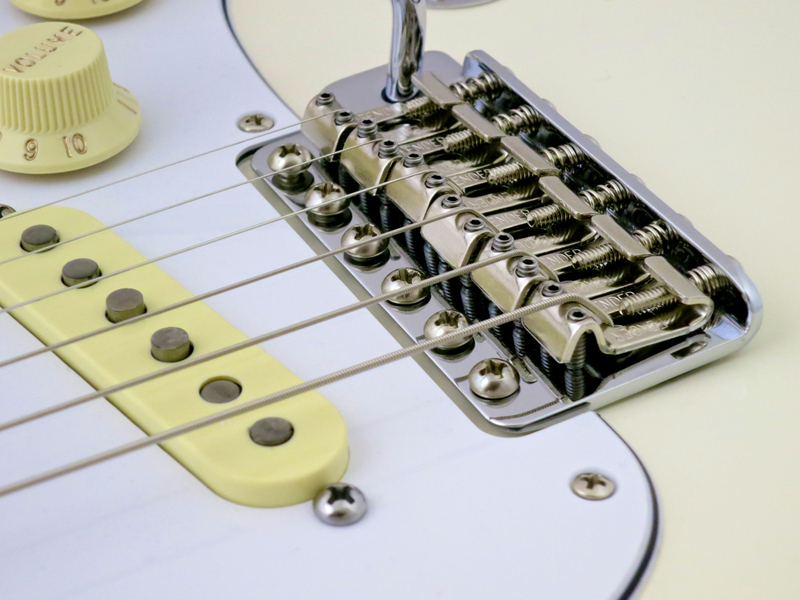 Fender’s vintage vibrato bridge (the “Sychronized Tremolo”) sports bent steel saddles. 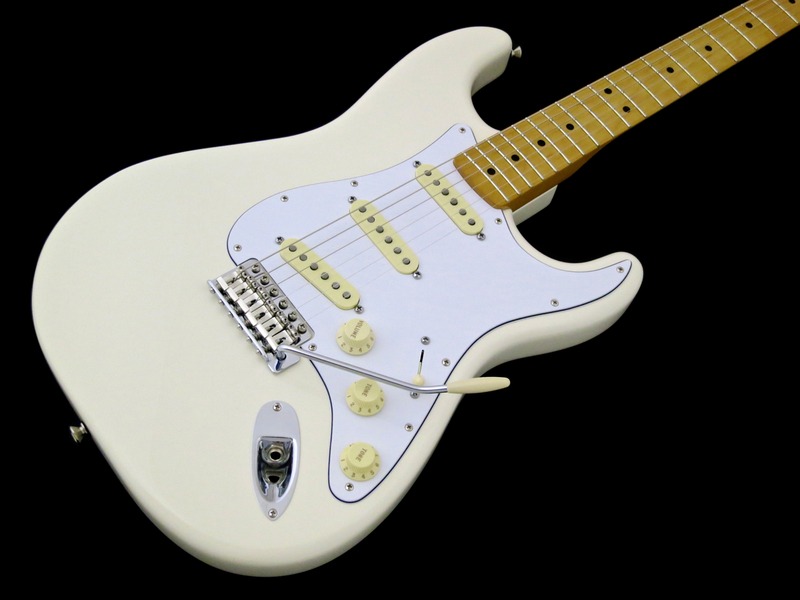 Fender Strats are well-known for their excellent ergonomic properties and the Hendrix signature model stays true to this heritage. Our review instrument was of comfortable moderate weight. The neck’s mid-Sixties C-profile feels great, thanks to not being overly chunky. The guitar arrived strung with a set of 010s and tuned to E-flat, but the setup wasn’t quite spot-on. The vibrato bridge was tipped a little too steeply, and the intonation was a bit off on the bass strings. But it only took me a couple of minutes (and the correct pair of screwdrivers) to get this Strat shipshape. The result was a great-playing and great-sounding guitar (string height at 12th fret: bottom-E: 2.2 mm/high-e: 1.7 mm). 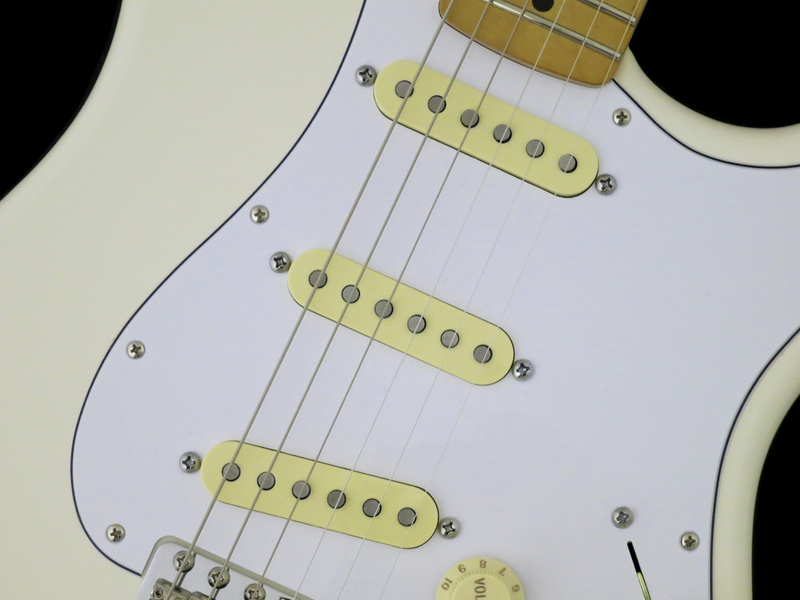 The flatter-than-vintage fretboard radius really helps to make the Hendrix Strat a very bend-friendly guitar, while also minimising the possibility of fret choke during large-interval bends. I must admit that I’m not quite sure, whether I really hear much of a difference in the amplified sound of the reversed pickups, though. Jimi’s guitar tech and effects guru, Roger Mayer, has often stated that Hendrix was satisfied with the sound of his (right-handed) Strats right off the peg. According to Mayer, the only “customisation” the pair ever did on newly bought guitars, was to take off the neck and remove all possible finish residue inside the neck pockets to improve the stability of the neck joints. Hendrix’ effects, on the other hand, were a regular target for fine-adjustment and electronic customisation. Even though Jimi Hendrix was known for his avant-garde use of effects in the studio – buoyed by the creativity of his sound engineer Eddie Kramer – his signal chain on stage was surprisingly straightforward. Here’s a short and basic rundown of Hendrix’ live rig. Jimi Hendrix used what we now call a vintage-type, non-master volume amplifier stack, which wasn’t especially high-gain by today’s standards. Usually Hendrix had two 100 Watt Marshall-stacks running in parallel, which meant things got very loud. His Strats would cause his amp to break up, but the type of distortion was closer to what we’d now call a 60s Blues sound than to 70s Metal, and far removed from the high-gain saturation of our time. I simulated this type of amp response by turning my Blackstar HT-1R’s gain control up to get the clean channel to overdrive. In my view, the fuzz pedal is the most important ingredient in Jimi’s sound, because it adds a lot of oomph, creamy compression, and aggression to proceedings. A British importer of musical equipment, a man called Ivor Arbiter, came up with the Fuzz Face in 1966, because he wanted to have a fuzz pedal in his product range. He came up with a chunky package by having the Fuzz Face circuit built into the base of a 60s microphone stand. The round enclosure, coupled with the unit’s two controls and single footswitch, looked like a smiley face, which is where the pedal got its name from. Hendrix generally used his Vox Wah in front of his Fuzz Face, but keeping it behind the fuzz will also result in some cool tones. Great wah-pedals can also be head from Boss, Mission Engineering or Jim Dunlop. Roger Mayer’s Octavia-pedal was sometimes used as an additional ingredient in Jimi’s live sound. This strange-sounding effect combines distortion with an artificial upper octave and some slight ring-modulation. Hendrix also used a Uni-Vibe effect, which was one of the first pedals that tried to create a Leslie-like sound in a compact format. A genuine Octavia-pedal is only made by Roger Mayer, but Joyo’s inexpensive JF-12 Voodoo Octave stomp box sets you off in a very similar direction. Korg has introduced the NuVibe, which is a pukka re-imagination of the original Uni-Vibe-pedal. Voodoo Lab’s Micro Vibe is a high-quality proposition at a fair price. You can also simulate Uni-Vibe-style tones by using a suitable phaser. The Boss PH-3 is a modern and versatile phaser. If you want something even more affordable, you could check out Mooer’s range of effects. 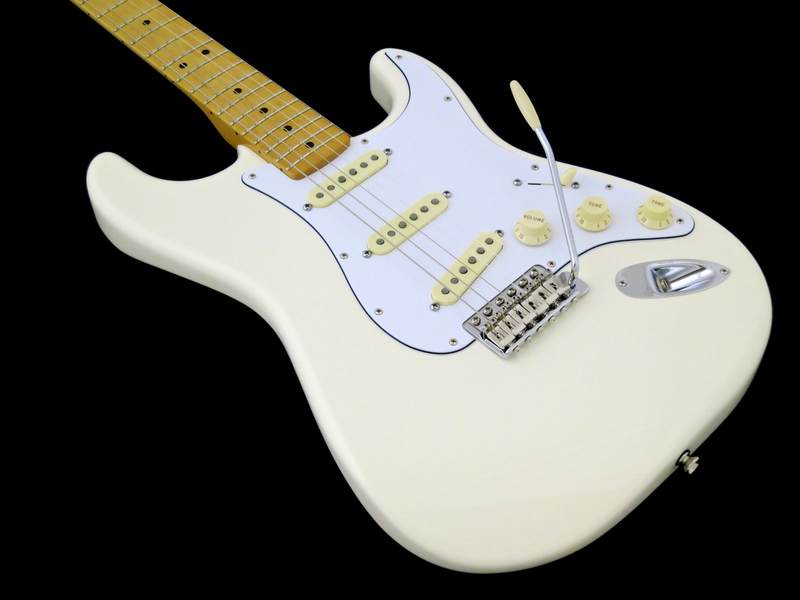 If you want to go all the way to “become Hendrix”, you will need to buy a left-handed Stratocaster and turn it into a right-handed instrument. The result will be authentic, but also much less comfortable than a regular Strat, because the controls are all in the wrong place. Fender’s new Jimi Hendrix Stratocaster will give you the (very slight) difference a reversed headstock brings to the playing feel, as well as the (very slight) tonal differences of the reversed pickups, while keeping all of the Stratocaster’s great ergonomics intact. 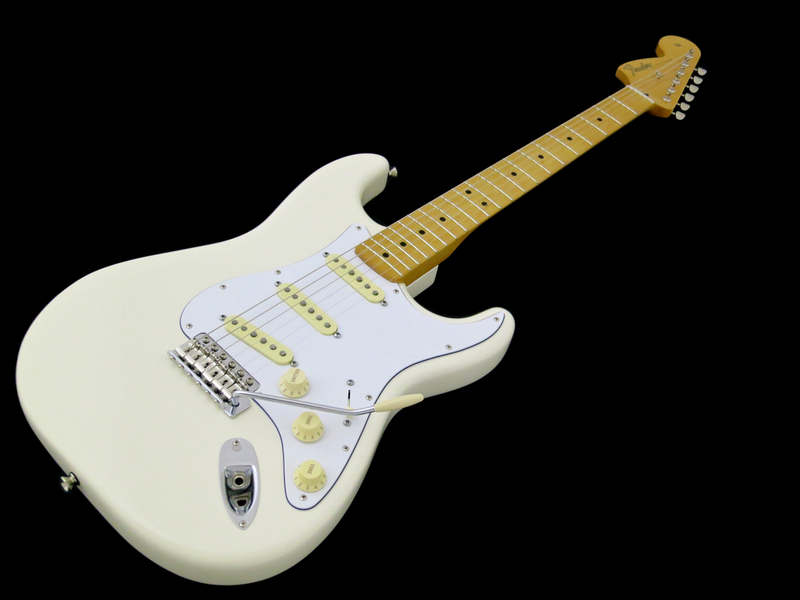 Fender’s Hendrix model is a fine Strat, which you can use for all types of music. Still, it’s the “Hendrix-thing” this guitar does the best! A big “thank you” goes to DLX Music Helsinki for the kind loan of the review guitar!